Fish – almost out of stock? Fish is a cornerstone of global food security. 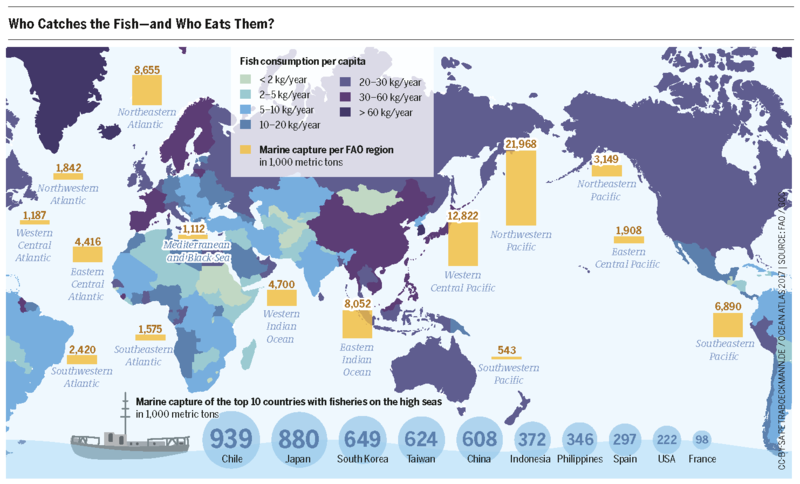 This global dependence on fish is actually the greatest threat to our fish populations. Many are overfished, and the number is rising. Thousands of years ago our ancestors already relied on fishing to feed themselves. And while on land, hunting and gathering was eventually replaced by sedentary agricultural culture, at sea, fishing was and is oriented towards one thing: the hunt. Those who fish do not sow. They take. This hunting behavior, together with increasing demand for fish driven by a growing global population, has caused global fish populations to shrink. According to the Food and Agriculture Organization of the United Nations, about 30 percent are overfished or even exhausted because they are not sustainably exploited. Another 58 percent have been pushed to the very edge of sustainability. That means approximately 90 percent of the world’s commercially exploited fish populations are exhausted. It is not possible to exploit them any further. All hope is not lost, though: most populations could recover in anywhere from a few years to a few decades with smart fisheries management. There are successful examples of such concepts in the USA, New Zealand, Australia, Norway, and the EU. Many populations have recovered there. In 2009 Europe’s seas were 90 percent overfished – today, that number has sunk to just 50 percent, in part because of stronger restrictions and limits on catches. But not all populations are in a position to recover quickly even if they are sustainably exploited. Some populations of large food fish like marlin, swordfish, shark, and cod have already shrunk by up to 90 percent. Dolphins and sea turtles, victims of bycatch, are partly threatened by extinction. They do not recover quickly. And many types of tuna belong to the species whose populations will not recover as long as they are still actively fished to any extent. Their market value is so high that hunting them is still profitable even though few of them remain to be caught. Red tuna is so highly valued that it regularly fetches dizzying prices on the Japanese market. In 2013 a Japanese sushi chain bought a particularly impressive specimen for 1.3 million euros. All told, 85 percent of the red tuna catch from the Mediterranean, and two-thirds of the entire global catch, goes to Japan. Many developing countries are especially dependent on fishing. Fishing is the primary economic activity there. It is estimated that there are approximately 12 million small-scale fishermen globally. The industrial fisheries, on the other hand, only employ 500,000 people. Per person, though, these industrialized operations catch many times what small artisanal fishers pull from the sea with their nets. With factory ships equipped with modern technologies like echolocation, reconnaissance planes, and gigantic nets, they fundamentally exhaust the traditional fishing grounds. The big ships operate around the world and search for the most profitable fishing grounds, like the area off the coast of West Africa, where there is little state regulation and they can easily outcompete the locals. Another large problem for maintaining fish populations is illegal, unregulated, and undocumented (IUU) fishing. This refers to fish caught with unauthorized fishing devices, at unauthorized times, or in protected areas, as well as to catching species of fish that are prohibited or to catching more than is permitted. 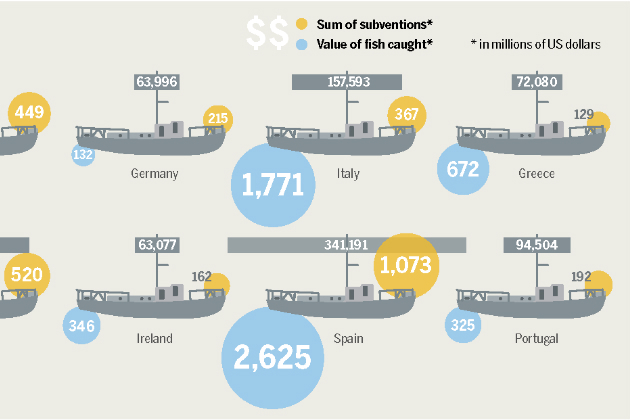 Illegal catches comprise up to 31 percent of the global fish catch. Some ship owners avoid state control by sailing under flags of convenience. Others exploit the fact that it is very difficult to track IUU ships in places like the islands and archipelagos of Indonesia. A similar phenomenon occurs in the Bering Sea, where IUU fishing is mainly driven by Russian and Chinese firms. The rate of IUU fishing there is 33 percent. It is estimated that 500,000 tons of illegally caught fish circulate each year. 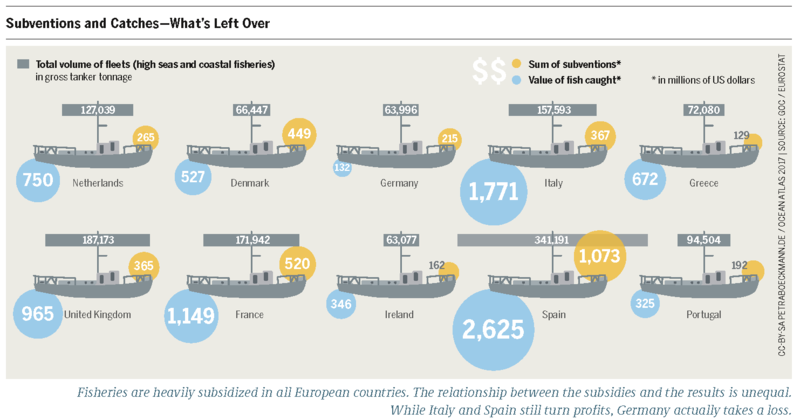 The EU has introduced stricter harbor controls, but illegally caught fish still end up on European plates. Political expediencies are also responsible for putting pressure on fish populations. For example, for years Spain and Portugal, fearing unemployment, subsidized drastically oversized fishing fleets and thus accelerated the exhaustion of their fisheries. 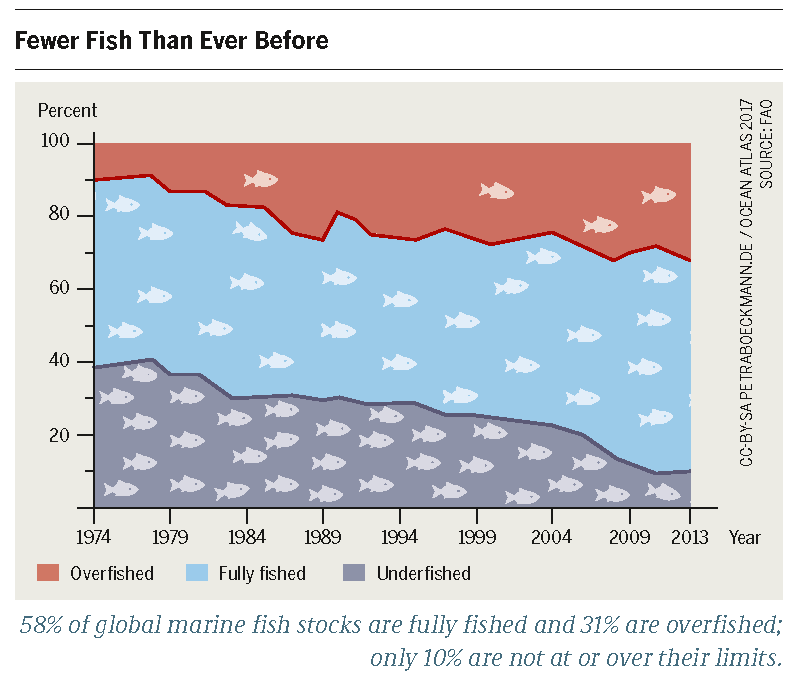 If ministries of fishing would systematically follow scientific recommendations and only fish populations so that over the long term they take only the maximum sustainable yield (MSY), the world’s fisheries really would be the constantly growing resources that we mistakenly assume they are. Ending subventions, like fuel subsidies, would be a good start. » You can download the entire Ocean Atlas here. Overfishing, the loss of biodiversity, and an immense pollution – the seas are under stress. The Ocean Atlas 2017 delivers in more than 40 infographics and articles all the relevant data, facts and contexts. Aquaculture: Are Fish Farms the Future? Aquaculture is booming – in 2014 nearly every second fish consumed by people came from a fish farm. The ecological and social problems caused by this aquatic stockbreeding are immense. The mounds of garbage on some coasts pose clearly visible problems. Other types of pollution are less visible – but every bit as serious. Without the ocean there would be no life on our planet. But the future of this unique ecosystem faces a grave threat today. The Ocean Atlas 2017 delivers with its 18 contributions and 50 graphics the relevant facts and figures about the ocean.